Today is the actual release of the Nature’s Promise Collection, so I thought I’d do a quick blog post featuring Wise Owl, as it has proven to be quite popular on social media. 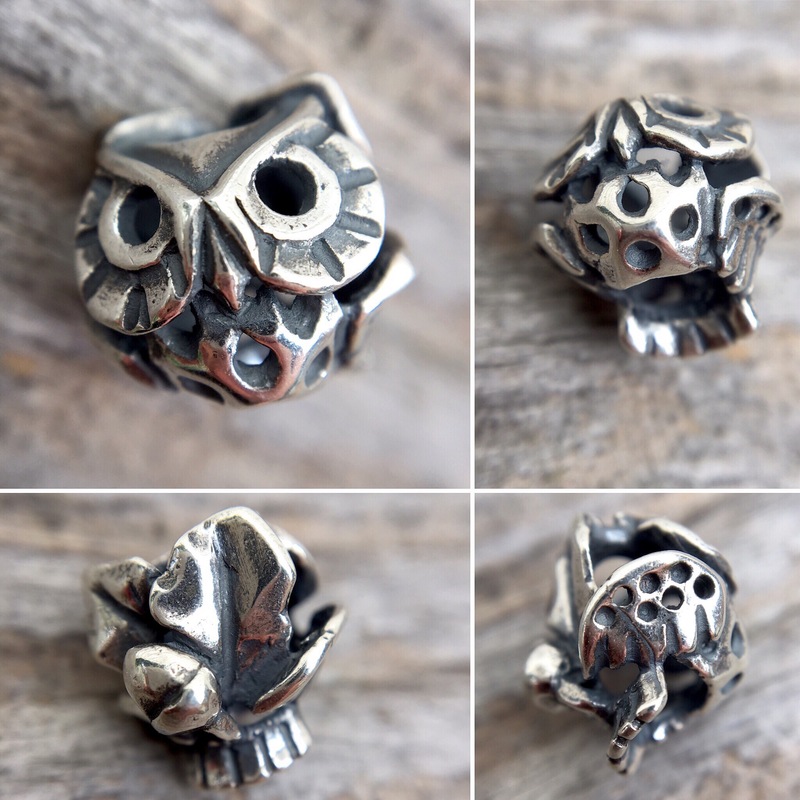 Here is what it looks like from all angles, as seen on my Trollbeads Autumn 2017 Live Image Preview. It has fairly large holes in the top, bottom and sides and so can be used as a splitter on a Fantasy Necklace. 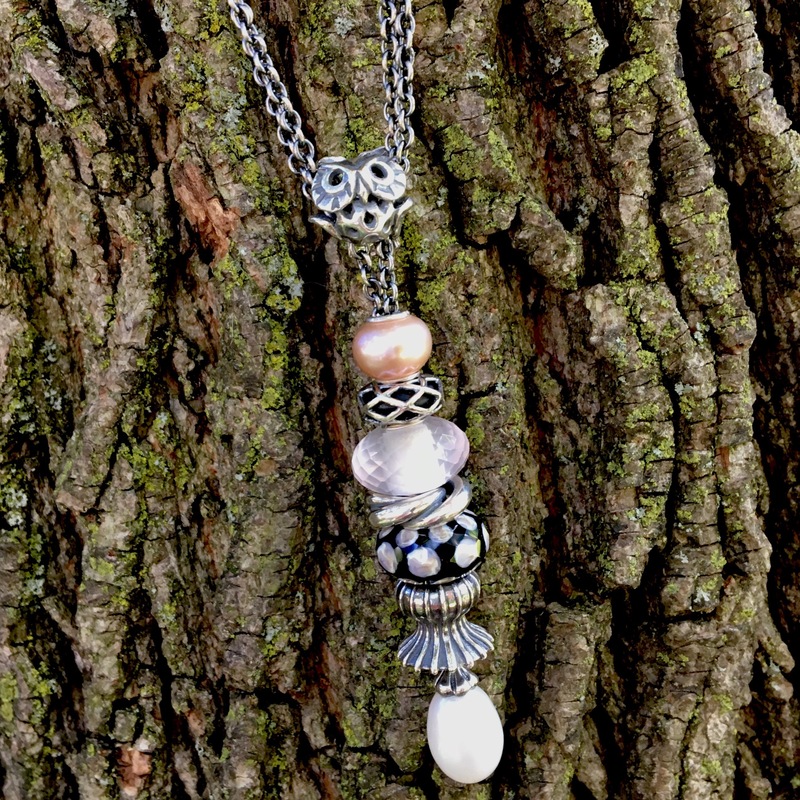 The beads used below the Wise Owl are a Pink Pearl (and isn’t this a gorgeous one? ), the Night Sky Spacer, Rosa Quartz, Infinity, Raindrops and Capsule of Life on a White Pearl Fantasy Necklace. 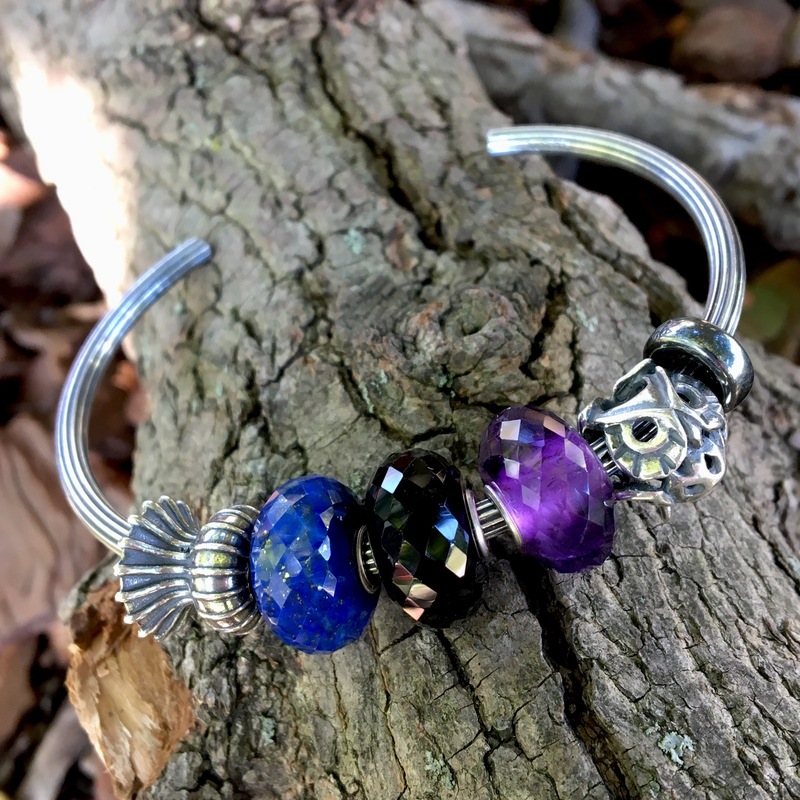 Wise Owl looks adorable on a bangle. Here I was thinking of a night sky and used the Capsule of Life, a Lapis Lazuli, Black Onyx and Amethyst on the new Star Bangle. 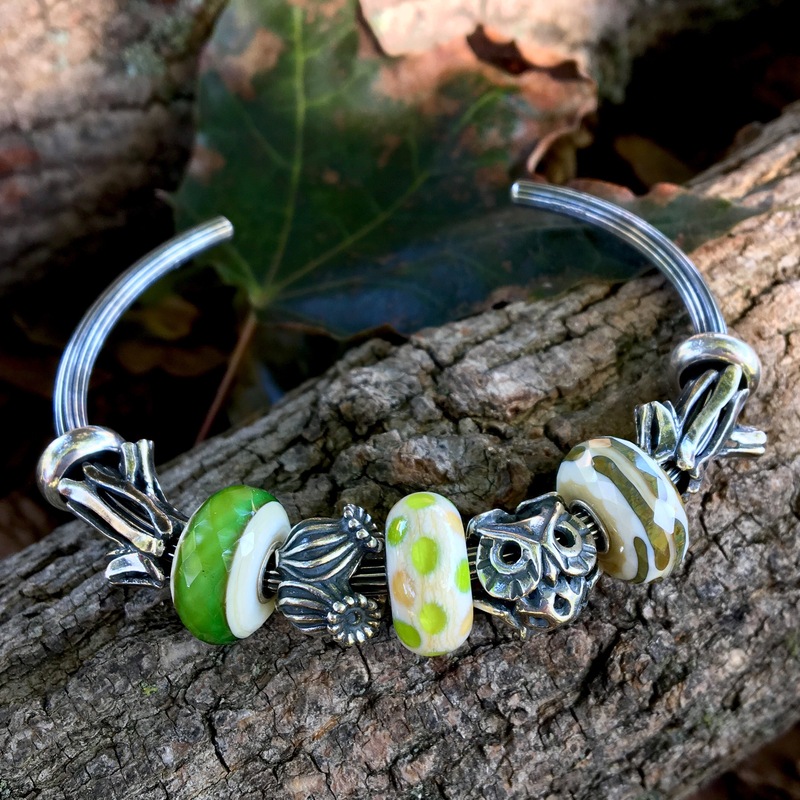 On this bangle I went with a woody green theme. Left to right are Trunk of Treasures, Glimpse of Green, Shelter, Slumber, Wise Owl, Willow Twigs and another Trunk of Treasures. 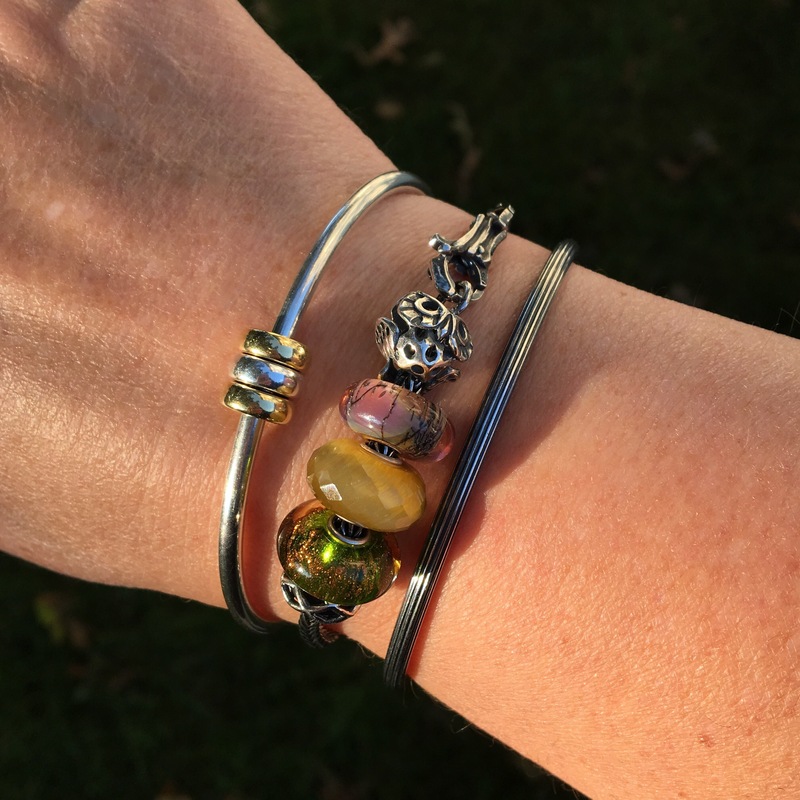 One evening I decided to make a mini bracelet and it looked so pretty in the setting sun. The glass beads are Forest Mist, Cat’s Eye Quartz and Sparkling Moss. 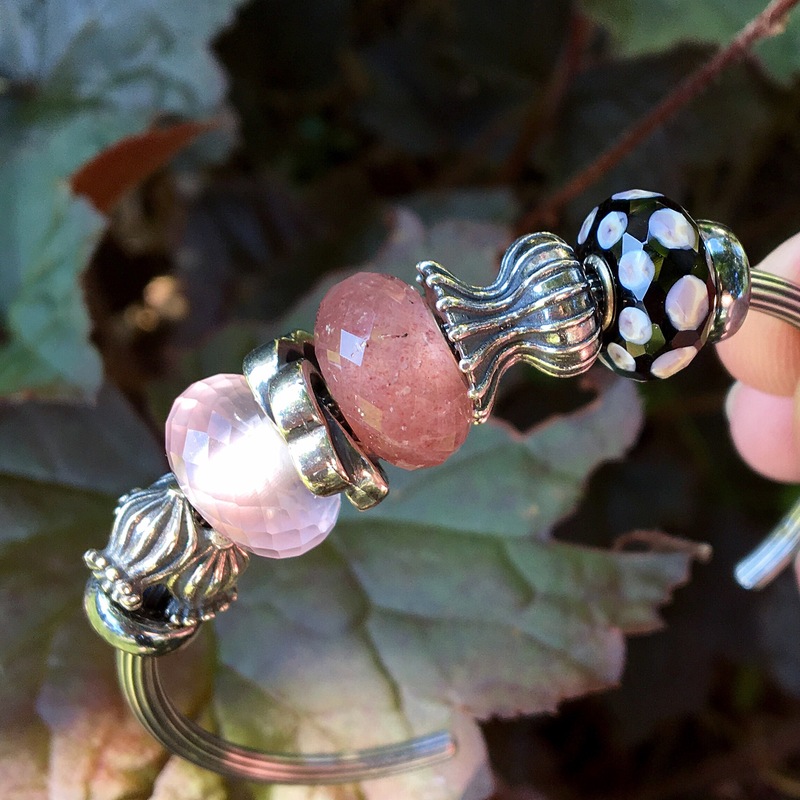 Here are a couple of other random ideas of ways to use some of the new beads. I think the Voice of Wind has a retro feel to it and I like it with these Pink Prisms! Ok, I must say I can’t wait to see people’s photos on Instagram. If you’re not on Instagram, feel free to upload your photo to my Facebook page as I’d love to see what you bought! I went to shop today. The owl is so cute. I love its back side too! I love the owl too! I shall look forward to your photos, Kyungjin! Hi Martha, I love every combination you’ve done. I don’t usually wear necklaces, but that Pearl Fantasy Necklace is beautiful! The more I see this collection the more I love it. Most collections; at least for me, will have a few beads I really love and then the rest are either okay or I just don’t like them. There’s not one thing I wouldn’t want here! I looked back on your other posts for the Autumn collection, and I realized I add more to my wish list each time you show something from it! That doesn’t even count the Lapis Lazuli and the Pink Pearl I’m looking at right now. Groan!!! Suzanne, I totally hear what you are saying. When I first saw the collection I was just in awe and as you say, there is so much to love here. 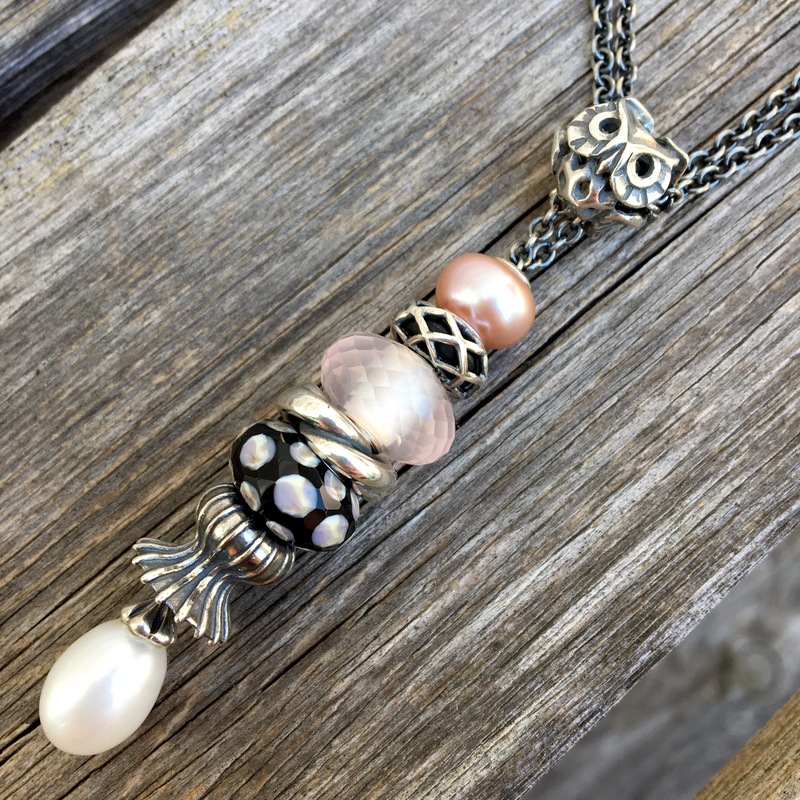 I’ve been wearing a necklace every day for work and just love how you can customize them. The Fantasy Necklaces are super comfortable if you’re not used to wearing necklaces. Even with several beads on I don’t really feel it around my neck, yet get to enjoy looking at the beads! Ooo-Forest Mist is beautiful! Enjoy! Hi Isa! Yes, it’s such a cute little owl. I always think it’s looking at me! Kim, I also think this collection is just wonderful. 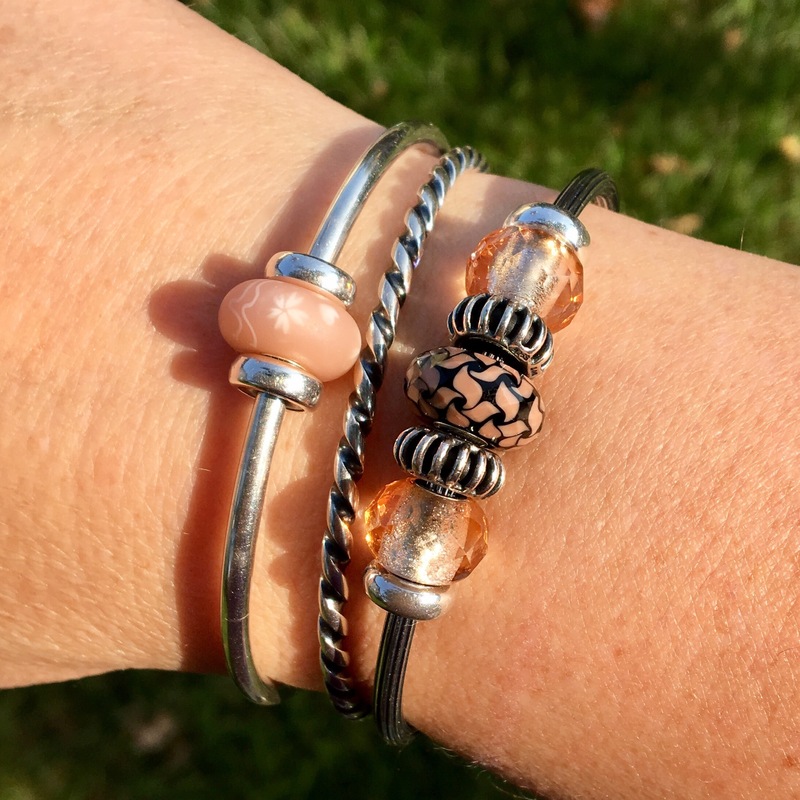 The beads you bought are so lovely and can go with so many things. The pale lavender in the Raindrops, the peach colour in Voice of Wind, there are just so many possibilities and that’s what’s so fun! Even though I’ve had the beads for a bit I feel like I have hardly begun to play with them. The Capsule of Life is absolutely my favourite silver piece, I think. My Instagram photo for tomorrow has two of them on the Star Bangle and the texture is so amazing! I love how Roberta (@just.me.roby) used it with a prism today, as the prism snugged in so nicely. I can imagine you’ll have a hard time prioritizing at GLB where you’ll be seeing the whole collection!